Have you ever read 90 Minutes in Heaven by Don Piper? It's a touching, incredible story of a Baptist preacher pronounced dead at the scene of a collision with a tractor trailer, while he was returning from a ministry conference. He describes his near-death experience of meeting spiritual influencers in his life in heaven, and coming back to earth to face a terrifying and difficult recovery. And this is the other side of the story. A Walk Through the Dark is the fascinating tale of Don Piper's WIFE, who was by his side from the moment he arrived at the hospital through the darkest stages of recovery. 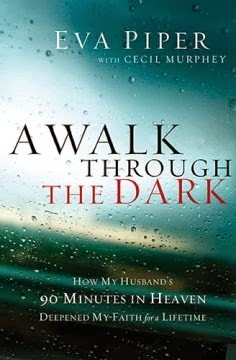 The subtitle is, "How My Husband's 90 Minutes in Heaven Deepened My Faith for a Lifetime." Wow. I am on the fence about this book, to be honest. It was interesting at first, and parts of the tale are dynamic and gripping (such as her difficult choices on her husband's medical care following the accident) and her story of dealing with a husband who wanted to return to heavenly bliss. But the actual writing of the book loses me. It reads like a personal outpouring, a tell-all maybe interesting to family members, but that should have been much more tightly edited. And if I'm being perfectly honest, I felt that Eva had not fully healed from all of her sadness, hurt, and despondency since the accident. I got bogged down in the middle and put this book down for a long time before I decided to pick it back up. It was, however, very interesting to me to hear the often-untold side of the caregiver and how their life is changed just as much as the person injured. I think this book will probably resonate strongly with others who have been in a similar situation.